ILFA is about to end (for real this time), and when the final posts go up tomorrow, they'll include several acknowledgments and thank yous. While this blog has been, in some respects, a solo effort, there's no way it would have gone on for this long or garnered as much interest as it did, once upon a time, without the comments, suggestions, ideas, and support of a great many people. Today, however, I'm passing the keyboard to ILFA's number-one supporter, the lady, ILFA's partner in life, love, and (sometimes with a well-deserved eye roll) blogging. 1. The arrival of Franklin the Cat, ILFA's tormentor/tormentee. 2. ILFA ducking for cover. 4. Debating ILFA's hair in the comments... or just hitting on him in the comments. I see you! 5. The greatest comment EVER (FEB 25TH, 2013 1:27am). I love ILFA most for writing about things that are hard. Nick doesn't hide behind cynicism or indifference. He does not skirt the issue of his role in the changes in the neighborhood. It is what I am most proud of about Nick and his blog. This is one of his first long posts dealing with it - the devil vs angel shoulder conversation is who Nick is through and through (though 90% of the time, he chooses to go to the community meeting). My favorite day of the year on the Avenue! The work that the merchants, volunteers, and especially Kevin and Garnett put in was always paid off in full, as the money they raised helped to create the most amazing kid fairs I've ever seen. Kids Day was truly unique, as it felt like it was for everyone in Crown Heights. Everything was free (popcorn, games, face painting) and everyone had an unforgettable time. Kids Day was Franklin Avenue at its best. My mind was blown...we'd been thinking about moving, but the shift made me think "we've gotta stay here and see what happens." I know this just happened and I know you all probably read it already, but whatever, it's honest. Okay, these are technically two links, but I think they have the same heart so I am counting them as one. ILFA's need to know all the history and weird quirks of our fair borough has led to some amazing finds, my favorite being Softtee gas/soft serve stations. The idea of pumping up with gas and soft serve seems so efficient and so disgusting all at the same time. This section could actually go on forever, but you get the idea. As ILFA winds down for good (only two or three more posts to go), it seems only appropriate to run one final year-in-review post, something I started two years ago (2011) and also did last year (2012). As usual, it's been a busy year. 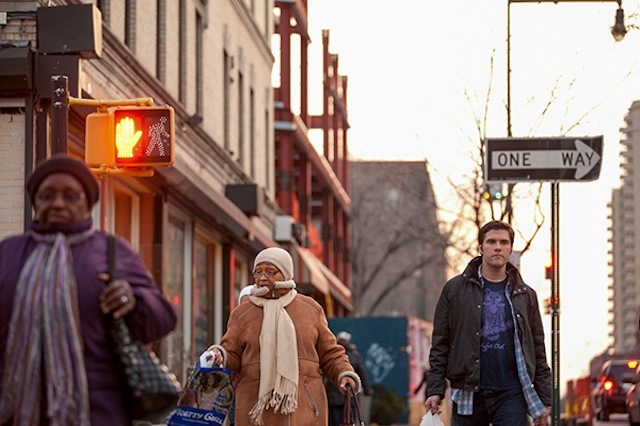 Vinnie Rotondaro and Mo Ewing kicked off 2013 with a long look at Franklin Avenue in flux. Published by Narratively in January, the piece, titled "The Ins and the Outs: A Look Below the Surface at Gentrifying Crown Heights," generated ample conversation around the neighborhood. Gentrification doc "My Brooklyn" also ran for three weeks in DUMBO, offering another opportunity for those of us with time on our hands and keyboards beneath them to argue it out. February was a contentious month in Northwest Crown Heights, with debates heating up around the infamous bike corral and charter school co-location plans and MySpaceNYC issuing a cease-and-desist order to the Crown Heights Assembly in response to the Assembly's tenant organizing (MySpace would follow this up with a $31 million suit in early March). On the side of unity, SOS Crown Heights launched their third annual Arts to End Violence festival. 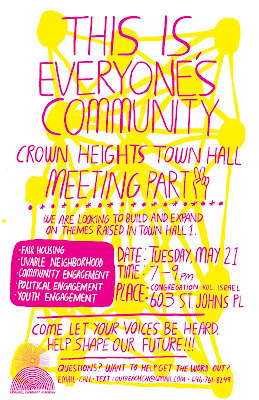 In March, ILFA had the privilege of joining with neighbors and friends to put together the Crow Hill Community Association's Town Hall Meeting (recap post here). The meeting brought hundreds of local residents together to discuss issues of neighborhood change, and several working groups were developed in the weeks and months that followed to address issues including politics, housing, youth opportunities, and sanitation, among others. The meeting (and the process of organizing and following up on it) encouraged many folks - longtime residents and new arrivals alike - to become active in the community, and also prompted the CHCA to increase outreach and revise its bylaws, a process that will doubtless continue after Board elections in January. I'd love to tell you we solved everything on March 23rd, but organizing is a never-ending process. The Franklin Park Reading Series also celebrated four great years on the Avenue. Zoning was the number one issue along Franklin in April. Undertaken by the Department of City Planning at the request of CB8, the plan (now approved) downzoned and added height limits to the area's picturesque side streets while upzoning a sizable chunk of Franklin (with some incentives, but no requirements, for affordable housing) and reducing the scale of potential commercial development along Nostrand. The CHCA hosted another big meeting to discuss the plan, as well as their own landmarking efforts (still in the planning stages), and the Crown Heights Assembly and their allies rallied to demand better affordable housing. May brought the third big community meeting in as many months, as residents gathered at Congregation Kol Israel to form working groups and further discuss issues raised in March and April. SOS also hosted the second of their ongoing series of community conversations (begun the previous month as well), offering locals another chance to meet neighbors and discuss ways to constructively respond to the myriad challenges facing Crown Heights. In June, the opening of Cent'Anni and temporary closing of Kelso Restaurant prompted me to write a post about the accelerating disappearance of the Panamanian and Caribbean community (and the shops and restaurants where people congregated). While Kelso, happily, has returned with the same great menu and a few shiny new touches, the larger trend continues unabated. August brought the opening of The Pulp and the Bean II on Franklin between President and Carroll. As rents rise north of the Parkway, business and residents may increasingly look south. Owl & Thistle General Store announced a move to the block across from Pulp and Bean in the fall, and the Fisher family (which owns both Pulp and Bean locations as well as Bob and Betty's on Franklin and Lincoln) plans to open their next new supermarket in 2014. 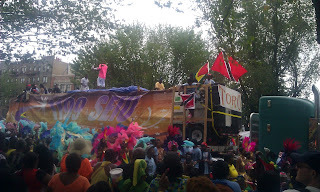 September, as always, witnessed the massive, fantastic, incomparable West Indian Day Carnival on Labor Day, as well as some exciting primarily elections in our own 35th Council District (Laurie Cumbo emerged victorious) and the citywide mayoral race. The newly-elected folks take office in a few short days, and will have their work cut out for them as the new year begins. In October, a big chunk of the Nassau Brewery complex on Franklin between Bergen and Dean was sold to Terra CRG, who are listing the property at $18 million. Under the new zoning, a building on the site could rise eight stories, and it'll be right down the street from the 1000 Dean development. A pair of condo developments along Bergen are nearing completion, and along Dean (which is, for the present, still zoned M1), many a former auto body shop is now sporting giant glassy windows. It's safe to say that more than a few people (with more than a few dollars to spend) are watching this particular corner of Crown Heights very closely. Also, in October, ILFA announced plans to wrap up the blog by the end of the month (as it turns out, I meant the end of the year). I wrote up my final "Roundup" in November, counting 70 new businesses that had opened and 43 that have closed (some of which closed and were replaced by even-newer businesses) since 2008. Among those that we lost in 2013 was TasteBuds, one of many ventures from Kevin Philip along Franklin, where he's been a businessman, landlord, electrician (just did the lights for the new O&T space), and all-around community builder for decades. Kevin - and Garnett, his partner in awesomeness - organized five great Kids Days in a row for the young people along Franklin, and worked tirelessly on everything from merchant association meetings to holiday decorations for the street to the Town Hall Meeting (which Garnett emceed while pregnant with their second child). While I miss the biscuits at Tastebuds (and didn't do a proper sendoff post for them at the time), it's seeing K&G on the Avenue nearly every day that I miss far more. 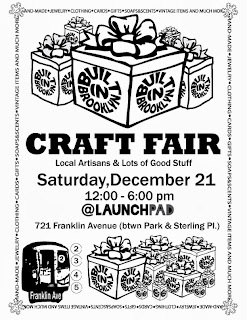 December... well, this is only the seventh post I've done in December, but I must say I was glad to see the Built in Brooklyn Craft Fair return to LaunchPad (who'll also be hosting their usual kickass NYE shindig, btw) after a long hiatus. It's impossible to wrap up a whole year of events in a paragraph or two, and this year ILFA trailed off considerably after June, leaving so much left unblogged, from citywide election issues to the whole "knockout game" mess (this article got it very close to right, particularly when the author pointed out the troubling comparison to "wilding," a past panic that destroyed the lives of five young men). Suffice to say, however, that 2013 brought a lot of changes and lot of talk about them. Some of this talk lead to action, and some of this action helped bring people together to address challenges great and small. While different groups will cite different victories related to their own particular campaigns, if there's one thing ILFA hopes will continue in 2014, it's these conversations. It's so, so easy to become isolated and individualized in this town, to become numb to violence, to inequality, to misery. Spending time with neighbors - at a CHCA meeting, a CHA rally, an SOS Community Conversation, a local business, on the damn sidewalk - is the best and strongest medicine for this kind of social atrophy, and it's where political and social organizing begins, too. 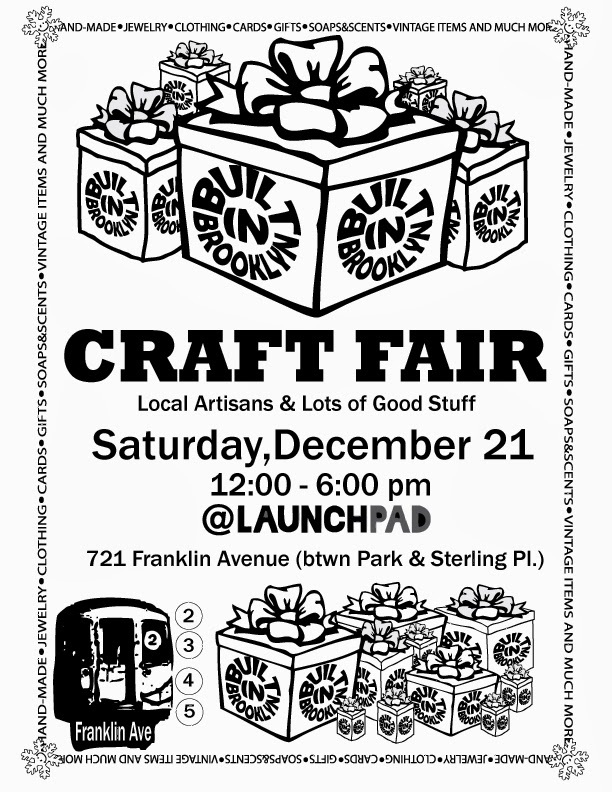 - The Built in Brooklyn Craft Fair returns to LaunchPad from 12-6pm tomorrow. It's always a great time, and there are a wide range of great things to choose from. - The good people at Calabar Imports have a great range of things, and their owner even said some nice things about ILFA in DNAInfo's profile. The least I can do is return the shoutout, and it's a great place! Swing by. - There's not too much distance between Owl & Thistle General Store and Stork, and ILFA relies on both for gifts (they're also both right across the street from Built in Brooklyn, and both stock a wide range of locally-produced stuff). - Barbara Campell NYC makes a range of lovely handmade jewelry (she also does hair!) right here on Bergen in Crown Heights. The lady met her the other day and was impressed (came straight home and told me to blog it. Yes ma'am.). - Park Delicatessen has sent along a range of great photos and ideas. Check 'em out here (and over on Classon, too). I'm sure there are places I'm missing. If you're partial to a local business for your holiday shopping, post a link here! 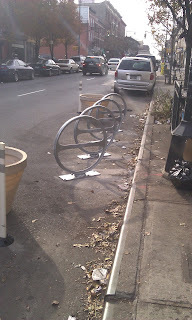 Anyone who lives within the confines of the five boroughs knows that space is always in short supply in this town. The fact that space is scarce and expensive (these things mayyy be related) is a particular challenge for the city's creative classes, who are forever in search of places to ply their trades without breaking the bank. Enter Crown Heights' very own FiveMyles, a non-profit gallery and performance space that's promoted experimental artwork, under-represented artists, and community engagement since 1999. ILFA's spent more than a little bit of time at their space at 558 St. Johns Place (between Franklin and Classon) over the past five years, for a wide range of great events including films, group shows, and community conversations. 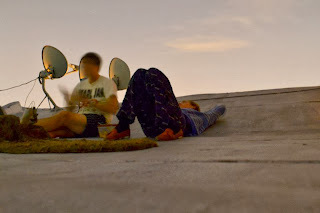 In addition to curating their own fantastic lineup, FiveMyles also offers their space to emerging artists and curators FREE OF CHARGE (you read that right) as part of their SpaceProgram, which takes place in between their own shows and during the summer months. They're currently accepting applications for their 2014 SpaceProgram in the months of May, June, July, and August. Complete info can be found at their website, and is copied below. If you or someone you know needs space this summer, send in an application. This program offers our venue, free of charge, to emerging, young artists, musicians and performers for unfunded short-term events and exhibitions, in-between our scheduled exhibition programming and during the summer months, when the gallery would otherwise be empty. Events often take place on the wide sidewalk outside FiveMyles. The on-going demand for the use of the FiveMyles gallery space through this program is indicative of the need young artists have to expose their work to the public, and of the difficulty of attaining it in New York. Making space available helps the arts retain the vitality and energy of a young generation of artists, and to encourage innovation and experimentation. Proposals are reviewed by our artistic committee. We favor projects that are risk-taking, require minimal setup, and make effort to connect with the audience. For a list of past SpaceProgram events, please click here. We are currently accepting applications for May, June, July and August 2014. Contact us at 718-783-4438, email us, or come by if you have any questions. The final CHCA meeting of the year takes place tonight at 7:30pm at the Gospel Tabernacle Church (725 Franklin, between Sterling and Park). Be there! No, that's not Brooklyn; that's the Museum of Our Industrial Heritage in Greenfield, Massachusetts. What's it doing here? Well, as regular readers will know, ILFA's a grad student in history during the day, and my love of all things historical has shaped more than a few posts on this site. I come by this passion honestly, which is to say that more than a passing interest in history runs in the family. I grew up helping out around the edges at academic conferences and institutes for my dad (some folks who see me at these conferences now remember the pudgy eleven year old who handed out programs) and driving around with my mom as she pointed out the landscapes, buildings, and historical sites of Western Massachusetts. It's a truism to say that I wouldn't be here without my folks, but it's also true to say that I probably wouldn't be doing what I do now if they hadn't introduced me to the joys of history. So when dear ol' mom finds herself in charge of social media for the Museum of Our Industrial Heritage as part of Valley Gives Day (a big 24-hour giving spree), it seems only fair that her blogger son should make a public pitch. So, if you've got a moment today, PLEASE like the Museum on Facebook, become a "fan" on their Valley Gives page, and, if you've got a few bucks to spare, consider sending a donation their way. THANKS! At our final event of 2013, we're closing out the year with a bang! We'll hear from a wide range of authors, including acclaimed Nigerian novelist and essayist OKEY NDIBE (Foreign Gods, Inc.), renowned Alt Lit poet and prose writer HEIKO JULIEN (I Am Ready to Die a Violent Death), and two of our favorite Brooklyn writers, SEAN H. DOYLE (The Day Walt Disney Died), and LAUREN BELSKI (Whatever Used to Grow Around Here). Plus: Heiko Julien will be giving a special lit & music performance! AWESOME BOOK RAFFLE: Prizes include a Civil Coping Mechanisms pack with titles by Gabriel Blackwell, Joseph Riippi, Gaby Bess, Heiko Julien, and more! OKEY NDIBE is the author of the novels Foreign Gods, Inc. and Arrows of Rain. He is co-editor with Chenjerai Hove of Writers, Writing on Conflicts and Wars in Africa. The founding editor of African Commentary, a magazine which was published by novelist Chinua Achebe, he teaches fiction and African literature at Trinity College in Hartford, CT.
HEIKO JULIEN is the author of the poetry and prose collection I Am Ready to Die a Violent Death. A poet, short story writer, and musician, he has published work in n+1, Volume 1 Brooklyn, Thought Catalog, Pop Serial, Shabby Doll House, and other places. He lives in Chicago. SEAN H. DOYLE is the author of the chapbook The Day Walt Disney Died. 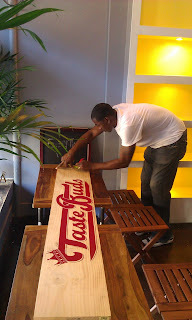 His work has appeared in PANK, The Rumpus, The Fiddleback, Volume 1 Brooklyn, Monkeybicycle, and other places. A Brooklyn resident, he works hard every day to be a better person and is learning how to love himself more. LAUREN BELSKI is the author of the short story collection Whatever Used to Grow Around Here. She is a graduate of the Brooklyn College MFA program and a recipient of the 2009 Himan Brown award in Fiction. A former New York City Teaching Fellow and AmeriCorps Volunteer, she is now an instructor of English at Brooklyn College. Her work has appeared in Story Quarterly, Nerve.com, Forte: a magazine of sound, Electric Literature’s blog “The Outlet,” The Rio Grande Review, The Trout Family Almanac, and other places. She lives in Brooklyn. - High school photographer/prodigy Nahshon Outten has his first solo show, featuring "cinematic portraits of daily life for the often overlooked and underestimated youth of Brooklyn" at Nimba Cafe on Saturday from 6-9pm. - Project 2x1, a documentary shot in Crown Heights with Google Glass (in part), premieres at Mister Rogers (Rogers and President) on Sunday. Complete info is copied below. Project 2x1, a Google Glass documentary, is premiering this Sunday, December 8th in Crown Heights. In hopes of bringing the film's mission of cultural appreciation and inter-community dialogue to life, the evening will include a film screening, Q&A with the filmmakers, ethnic cuisine, live music performances from Crown Heights musicians and a cultural celebration of the film’s subjects: The Caribbean and Hasidic communities of Crown Heights. Gallery opens at 7PM and the film premieres promptly at 8PM. - Finally, LaunchPad has their usual great slate of weekend events. please come support the donations are helping with the community work and various Projects of CHIEF69 and his associates. Chief69 is a Bronx based Bboy/Writer/Emcee and community organizer involved in the NYC scene since 2008 - he and his friends are always doing positive things from murals , to workshops , to parties and more but always with the touch and dab of consciousness AS KNOWLEDGE IS KEY TO ALL. A pop-up, temporary expo made with women photographers about women symbolism and lyricism. Artists in the exhibit are from USA, Mexico, Norway, Israel, Spain, Russia, Finland, Italy and Croatia. Benjamin Miller's Workshop informs students on the basic principal of sound vibration by building a variety of homemade musical instruments. Using books by Bart Hopkins from www.windworld.com, he helps attendees understand and build Rubber-band Guitars, Straw Oboes, Bobby Pin Marimbas, PVC flutes, Tin Can Drum Sets, 6-string Wood Planks, various Percussion and Mallets and much more! Time willing, Miller then discusses Composition, Open-ended Improvisation and Intuitive Listening. Attendees, Musicians and non-Musicians of All Ages, have Fun creating new sounds and recording them for posterity. Miller also shares his active and diverse musical background over the past four decades. Quartet Dali is a contemporary improvisation group set up specifically for multi disciplinary performances. The focus of this performance is to present an improvised live score to a series of classic silent films. The performance flows seamlessly between musical performance and incidental music that surrounds the projection of a series of short silent films from Chaplin, Dalí, Duchamp, Méliès and others. Leaning towards avant-garde, Quartet Dali wants to blend musical concert performance with incidental film music allowing both the music and the film to be understood in a different way.